I had Bitcoin-Qt on my computer with several bitcoins in my wallet, using Vista. Then my computer crashed. Finally I was able to get my computer fixed and download a new version of Bitcoin-Qt. Now I would like to import my original wallet.dat from the old client which was encrypted into an new version of Bitcoin-Qt. How do I do that? First, close the Bitcoin-Qt client. In that folder, there should be a wallet.dat file. If you currently have no bitcoins in your wallet, you can just delete that file and replace it with your backup. If you have some bitcoins in this wallet as well, backup that wallet file as well, or send all the coins to an address from your backed up wallet. Go to C:\Program Files (x86)\Bitcoin using Windows Explorer. 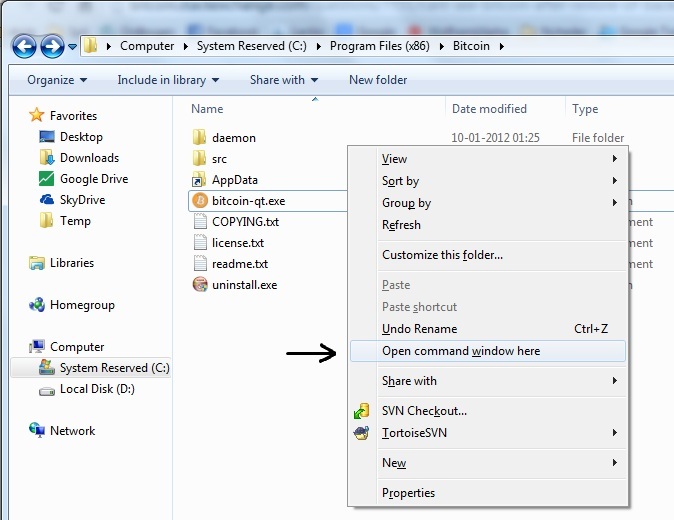 In that folder, hold shift and right-click and select Open command window here (picture). In the command prompt, type bitcoin-qt.exe -rescan and hit enter (picture). Now Bitcoin-Qt should start and rescan the blockchain to calculate the balances of the addresses in your wallet.dat file. Backup your original wallet.dat file (~/Library/Application Support/Bitcoin/wallet.dat by default). This contains the private keys for your bitcoins. If you lose it, you lose your coins. Install Bitcoin Core on a machine with 100s of gigabytes of free space. Allow it to download the blockchain. This could take days. Replace the wallet.dat file on the new machine with your old one. Start Bitcoin Core on the new machine with the rescan flag, to scan the blockchain for your newly imported bitcoin. You can do this with the command line /Applications/Bitcoin-Qt.app/Contents/MacOS/Bitcoin-Qt -rescan. This can also take a long time (hours). Your wallet should now be imported and working on the new computer. 4. Paste your other wallet.dat file into the folder. 5. Open BitCoin Client  , blocks get checked and updated, and you should see your amount. 6. I'm not sure that you need to do command prompt with the -rescan... I didn't have to..
Not the answer you're looking for? Browse other questions tagged bitcoin-core wallet-import or ask your own question. Help with very old wallet.dat file and keys, next steps? Lost my bitcoins, was I hacked? Can synchronization be interrupted and continued later? What happens to the original bitcoin after a wallet restore?